A sick Chipotle employee caused a norovirus outbreak at a Virginia restaurant earlier this month. The incident helped drag down the company's stock price. Multiple customers who ate at a Sterling, Virginia Chipotle (CMG) complained of nausea, vomiting and diarrhea. 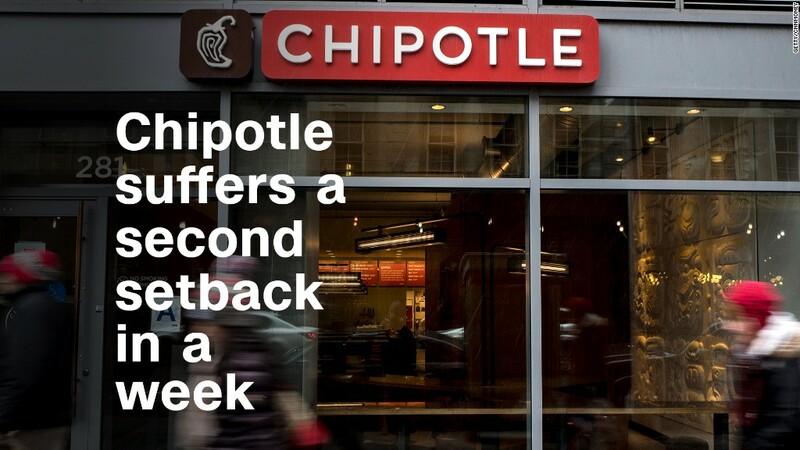 Those symptoms are consistent with the highly contagious norovirus, which has impacted Chipotle restaurants before. After completely sterilizing the location, Chipotle conducted an investigation to determine the cause of the outbreak. On a call with Wall Street analysts Tuesday evening, CEO Steve Ells said a breakdown in the company's sick policy was the culprit. "We believe someone was working while sick," Ells said. In response, Ells and other Chipotle executives said they are drilling with employees that they cannot work while contagious. The company's employees will undergo another round of "comprehensive communication and training" to make sure everyone working at Chipotle understands how to prevent another similar outbreak from occurring again. Ells called the new messaging strategy "relentless training." Meanwhile, Ells defended the company's existing health protocols on Tuesday, calling them "excellent" and "designed by leading experts." But those rules are only effective if employees follow them, he said. "We took swift action and made it clear to the entire company that we have a zero-tolerance policy for not following these protocols," Ells said. "Compliance with our procedures is non-negotiable and a condition of their employment." Chipotle suffered multiple outbreaks of E. coli and norovirus starting in 2015 that sickened hundreds of customers across about a dozen states. It temporarily closed restaurants and implemented strict health protocols in an attempt to fix the problem. Last year, a U.S. Attorney for California and the FDA opened a criminal investigation looking into Chipotle's outbreaks. The company revealed Wednesday that the government subpoenaed Chipotle's records of the latest outbreak as part of its investigation. The company can't seem to keep the bad health news away. Last week, several mice were spotted in a Dallas Chipotle. The rodents squeezed through what Chipolte called "a structural gap in the building," which was eventually closed. Ells apologized to Chipotle's customers on Tuesday. Wall Street, which had sent the company's stock down 14% this month, was wooed by Chipotle's relatively strong second-quarter sales. Shares grew by nearly 3% in pre-market trading Tuesday.